Introduction to English as a Second Language Teacher’s Book is part of the series of resources which bring students to a level where they are ready to study Cambridge IGCSE® or equivalent courses and accompanies the Introduction to English as a Second Language Coursebook and Workbook. The series is written by an experienced ESL teacher and trainer, and includes answers to all of the exercises in the Coursebook and Workbook. This book features Top Tips to help teachers with the course and Differentiated Activities to stretch able students while supporting those that need more help. Advice and Top Tips to help teachers with the course. Differentiated Activities to stretch the more able students while supporting those that need more help. Language Tips to help teachers to focus the lessons on the vital language skills needed to succeed in the course. 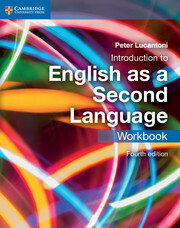 This Teacher’s Book accompanies the Introduction to English as a Second Language Coursebook and Workbook. Unit 1. How many planets are there in space? Unit 7. Can penguins see under water? Unit 9. Who was Ibn Battuta? Unit 15. How do you say 'bridge' in your language?